WASHINGTON – Jesuit-run Georgetown University has created a culture that helps students understand that serving others and being committed to something larger than themselves is important in life, according to one school official. “Service is part of what it means to go to Georgetown. Part of our tradition is engagement with the larger community,” said Kathleen Maas Weigert, executive director of the university’s Center for Social Justice Research, Teaching and Service. So the fact that each year many Georgetown undergraduate alumni – along with their counterparts from a number of other Catholic colleges and universities – volunteer for the Peace Corps should come as no surprise. On Jan. 12 the Peace Corps released its annual list of top volunteer-producing U.S. colleges and universities in 2008. The Peace Corps ranks schools according to the size of the undergraduate student body. Schools with under 5,000 undergraduates are small. Medium-size schools have between 5,001 and 15,000. Large institutions are those with more than 15,000. Georgetown University in Washington was the fifth-largest producer of Peace Corps volunteers among private colleges and universities. Of all medium-size colleges and universities, it was the ninth-largest producer of volunteers. Georgetown has nearly 7,000 undergraduate students; 35 undergraduate alumni served in the Peace Corps in 2008. “Who we are as an institution also plays a significant role,” she added. Jesuit-run Gonzaga University in Spokane, Wash., ranked sixth among small schools on the Peace Corps’ list. Gonzaga uses a “team effort” to prepare students to enter into a service career after graduation, according to Todd Dunfield, assistant director of the school’s Center for Community Action and Service Learning. “Our admissions office recruits from Jesuit high schools and looks for students who have had previous community service involvement. In interviews and writing samples, we look for people striving to be servant leaders,” said Mr. Dunfield. The university’s 4,200 undergraduate students perform approximately 100,000 hours of community service annually. The University of Notre Dame in Indiana, run by the Congregation of Holy Cross, was the 13th-largest producer of Peace Corps volunteers among medium-size schools. The University of Dayton in Ohio made the Peace Corps’ list for the first time, ranking 23rd among medium-size schools. “This Peace Corps ranking is really one among many great examples of how the university’s mission of learn, lead and serve gets lived out among our students and our graduates,” said Nicholas Cardilino, director of the Marianist-run school’s Center for Social Concern. The school has had 316 alumni serve in the Peace Corps since 1961. In 2008, 20 alumni from the university provided service. Jesuit-run Boston College ranked seventh among medium-size schools producing Peace Corps service workers. “Many students choose BC because they have already made a personal commitment to service,” said Marie Geary, associate director at the Boston College Career Center. President John F. Kennedy began the Peace Corps in 1961 as a challenge to young people to engage themselves in service to developing countries. Since then, 195,000 volunteers have served in 139 countries around the world. Of those 195,000 volunteers, 95 percent hold at least an undergraduate degree. 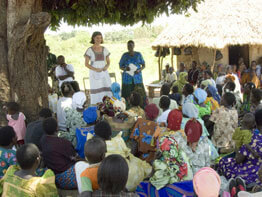 The mission of the Peace Corps is to promote peace and friendship among developing countries and the United States. The corps hopes volunteers can teach and learn from the people in the countries they serve.